Ben was playing with his SuperBen cape this morning - and out of the blue turns it around and says "Mom look, I'm ApronBoy!" Not sure that was the proud moment of the day.. but it still made me laugh. 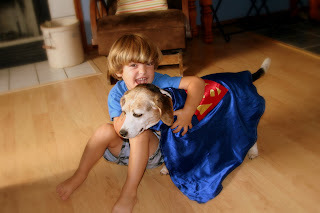 Later I found him terrrorizing his dog - with the cape. 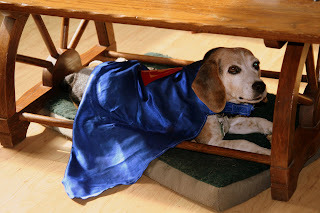 He was so proud Bailey was now a Super Dog, she on the other hand had a few choice barks and growls just for him. Dogs in their old age.. sheeesh! Cute!!!! and Bailey doesn't look any worse for the wear. Wonder Dog, Wonder what he is going to do to me next!